smiling brightly from their vase. a head-cold sapping my energy. “What makes a poet a poet? have been slowly swelling, voluptuously. Several weeks ago my husband took himself off to a bike auction. He came back with a brand new tandem frame that had never been built up into a bike and had only been painted with undercoat, and also a rather nice classic Claud Butler bike in need of some TLC. He is currently in the process of building up the new tandem (as if we need another tandem!) and has renovated the Claud Butler. 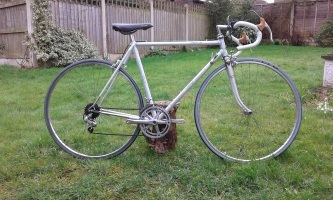 He has also been doing some work on my classic Henry Burton Bike, which I intend to ride when we go to do La Pedals de Clip classic road-race bike event in Catalonia in May. He has upgraded the gears so that I now have a front chain ring giving me 10 rather than just the 5 original gears; this should make it easier for me to get up the hills. He has also been doing some maintenance on his Falcon Henry Burton bike that he will ride at the Spanish event. Last week he went to visit one of his part-suppliers for the classic bikes where he saw a rather nice 1982 craftsman built Raleigh Record Ace bike (British made) with a fairly small frame which he thought would do for me. The next day (Friday) he took me up to see it and yes it is very nice indeed, fully original and almost pristine – it had been virtually mothballed for many years. Did I need another bike? Probably not but hey-ho, N+1! Well actually not this time as we traded in the Motobecane “Captain Beaky” which we had originally bought for me to do the Pedals de Clip a couple of years ago. “Captain Beaky” was a bit on the big side for me and after the event, we bought me the Henry Burton instead. Hubby had taken to riding the ‘Motobeaky’, as it became known, but as he had several others it was rather surplus to requirements so, nice bike though it is, we decided it could go. The upshot of all this is that we each had two bikes that needed to be tested and last Saturday was testing day. It had rained overnight but the morning was fine and fairly mild. We went out first on the two Henry Burton bikes, me to test my gears and him to check that the various things the had done were all working OK. We had to stop a couple of times to adjust saddle heights but basically everything worked pleasingly well, although we did get a bit muddy as the lanes we chose were still wet from overnight. The only problem that showed up was that the rear sprocket of my bike is shot, the bearings have had it, they have been making a noise for some time but only now has hubby decided it was time to do something about it before the Pedals de Clip. A new part has been ordered but not yet arrived. This little testing ride was about 4.7 miles. We then returned home for a cup of coffee and to change bikes. Off we went again, this time hubby rode his refurbished Claud Butler and I rode the new Raleigh, which had already had a shorter handlebar stem fitted to shorten the reach for me. Again all went well other than having to stop for saddle adjustments and also at one point my chain came off, probably because I had pulled the gear lever too far back on the front chain ring and the back chain ring was on a fairly high gear so it was slightly cross-chained. Some adjustment is needed by both me and the bike – we don’t know each other very well yet! This ride was over a different local route, on drier roads so we didn’t get the bikes muddy, and was only a bit over 3 miles. In all we only rode about 8 miles but as a testing exercise it was well worth while. We were all done and dusted by lunchtime when the wind was beginning to rise with the promise of the forecast storms and there were some rain showers, the best of the day had gone along with the sunshine. In January I ordered and paid for a book from the USA. I was told it could arrive in two weeks but to allow up to 30 days. Yesterday I followed it up since 30 days have passed and it hasn’t arrived. I am now told to allow 45 days! What are they doing? Bringing it across by paddle steamer? Being Monday I would normally post ramblings, often about cycling, but as I posted extra last week it’s just a ‘small stone’ today! We first became aware of the existence of the Tandem Club around the time that we bought our first tandem a few years ago, but at the time we didn’t think about joining it. However a few weeks ago my husband was after a few bits and pieces for a tandem he was building so we went on a visit to a bespoke tandem builder on the outskirts of Telford and not too far from our home. While there we saw an advert for the Tandem Club and noted that there was a local branch serving Staffordshire and Shropshire, offering rides out once a month, always in a different area of the region. So hubby decided to join. Yesterday we went out on our first ride with the club, which met up at Wem in Shropshire, not far from the Welsh border and about an hour’s drive from home. Wem, of course, is famous for its Treacle Mines, which have apparently been in operation since the time of the first Queen Elizabeth if not longer. The local residents are known as Treacle Miners – but that’s another story! We had an early start as we needed to be at the meeting place for 10.00am. As usual we were quite early, which was just as well as we did have some trouble finding the correct car park. It was a chilly start and at first I thought I was not going to be warm enough but of course once we got going both I and the weather did get warmer. Including us, three tandems turned up – the organisers and another couple who had travelled from Wales and also on their first outing with the club. There was also a solo cyclist who does own a tandem but apparently his wife was not well so he had come on his own. We set off for a wonderful tour of local villages at a leisurely pace. We were in no hurry as it was only 15 miles to the lunch stop and we had two hours to get there. 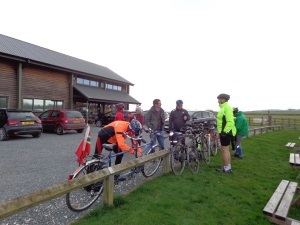 Meals had to be ordered in advance and the club works on the basis that if the ride has to be cancelled due to the weather then we still turn up at the lunch stop for a bit of socializing so that the café doesn’t loose out on the booking. I could list all the villages we rode through but that would be boring for those of you who have no idea where they are. Suffice it to say lunch was at a café in Baschurch, where we were joined by another couple of tandem riders who came without their tandem. It was an unhurried affair, the surroundings were very pleasant and the service excellent. The possibility of showers had been forecast for the day and we did have a short one while we were at the café. It had stopped by the time we left, having hardly wet the ground. The sun came out and we had a delightful continuation of our round trip through the countryside and back to Wem. At one time I was almost too hot and I contemplated removing a layer of clothing but I simply resorted to unzipping my jacket a bit, which was just as well as it was beginning to get quite chilly again by the time we got back to the car park. The round trip was about 29 miles in total which we rode, as previously mentioned, at a leisurely pace, which allowed for conversation on route. The terrain was gently undulating with only one quite taxing hill up to the village of Clive. The other new members had a slight mechanical about half-way up, hubby and I stopped to see if they needed assistance, which they didn’t, and we were soon underway again. Meanwhile the others waited at the top for us to catch up and take a breather. We got home again around mid-afternoon and were glad of a cup of tea and a warm up. We had taken a bottle of drink with us, I had bought a couple of sample sachets of a new rehydration drink to see what it was like – it was horrible! So we didn’t drink much on the way round and I will not be using that particular brand again, I’ll stick to the one I know and love. It was a very pleasant outing, more social than trying to cover significant ground at excessive speed and, although we have no details as yet other than the date, we are looking forward to next month’s ride when maybe a few more tandems might come along. We didn’t have time to visit the Treacle Mines of Wem and saw no signs to indicate their whereabouts but we did pass a shop with ‘The Treacle Mines’ painted on its fascia so perhaps that was the entrance and the mines are underneath the High Street. We shall have to investigate another time. Check out my post in a couple of days time when there will be more information about the Treacle Mines!